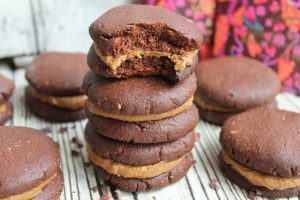 These cookies are just a dream come true as they combine 2 of my favourite things in the world: chocolate and peanut butter. Although they are super simple to make they so utterly delicious, decadent and will satisfy any sweet craving. If you are not a big fan of peanut butter you can totally use other nut butters, like almond or cashew. Start by preheating the oven at 180 degrees. Line a baking tray with some parchment paper. In a bowl mix together the ground almond, gluten free flour, baking powder and salt. Add the melted coconut oil, melted chocolate, date syrup and peanut butter. Mix everything together until you have a smooth dough ball. With your hands take about a small golf ball of the mixture and flatten it within your palms until it has a cookie kind of shape. Repeat the process until you have use all the cookie dough. Place the cookies on the baking tray and bake in the oven for 17-20 minutes. Don’t bake them for longer as they will become too dry or they might burn around the edges. 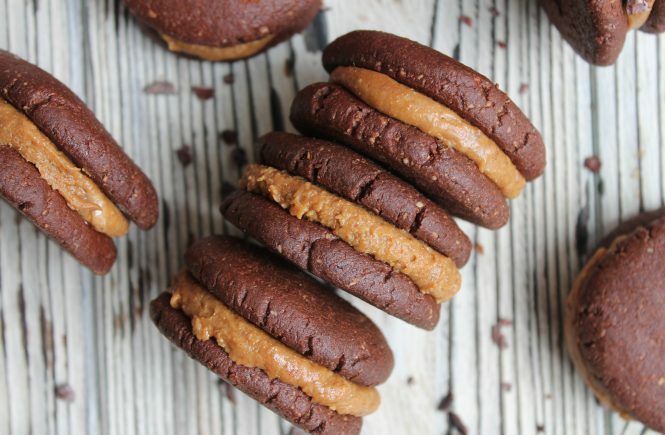 Let the cookies cooled down COMPLETELY before proceed with the filling.To make the filling simply mix the peanut butter with the date syrup until you have a creamy and smooth mixture. Spoon about 1 teaspoon of the mixture onto 1 cookie and place another cookie on top pressing the filling down so it will spread evenly across the cookie. Store the cookies into an airtight container in the fridge for few days. Preheat the oven at 180 degrees. Covered a brownies baking tray with parchment paper. Mix the ground flax seeds with the water and set on one side until they assume a gloopy consistency. In a food processor add the drained black beans and blitz for few minutes until a paste starts to form. Add all the other ingredients apart from the chopped dark chocolate and blitz gain. The batter should be thick and silky, not too runny. If the batter results too thick add a splash of almond milk. Transfer it to a bowl and fold in the chopped chocolate. Pour it into the baking tray and level it even with a spatula. At this point with a teaspoon or a fork swirl the almond butter on top of the batter. Place in the oven for about 35-40 minutes. The top should start to dry out and to crack around the edges. It shouldn’t be wobbly! If it is place it back in the oven for a bit longer. Once baked let the brownies cooled down in the tin. You can also place it in the fridge to firm it up even more. Cut the brownies once they are completely cool and store them in air tight container in the fridge. 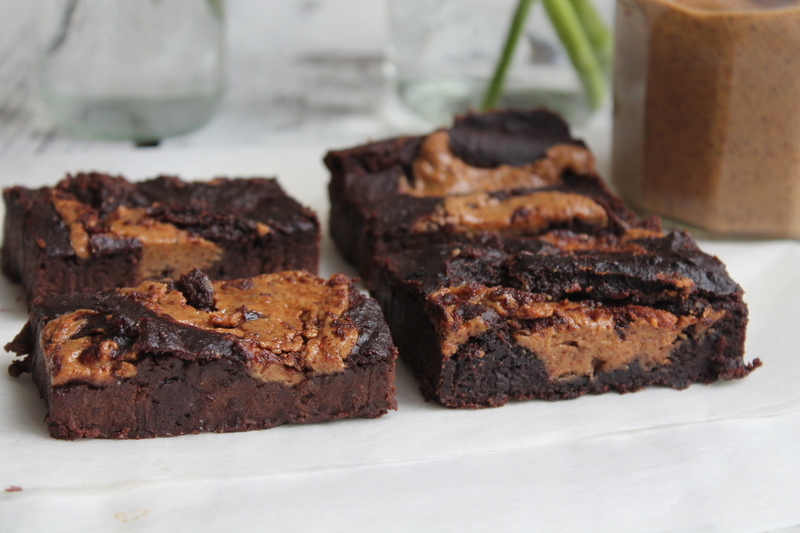 These brownies are meant to extra fudgy and gooey, I personally think they taste even better after few days chilled in the fridge. These are possibly the easiest cookies ever! They literally required an handful of ingredients and the cook in no time. 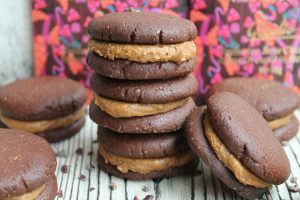 They are gluten free and they also happen to be paleo as I have used almond flour which gives them a dense and rich consistency. If you don’t have almond butter on hand you can totally swap it for peanut butter or cashew butter would probably work as well. These little beauties are packed in protein and relatively low in sugar so they also say ideal as a post work out snack. Preheat the oven at 180 degrees. Covered a baking tray with parchment paper. 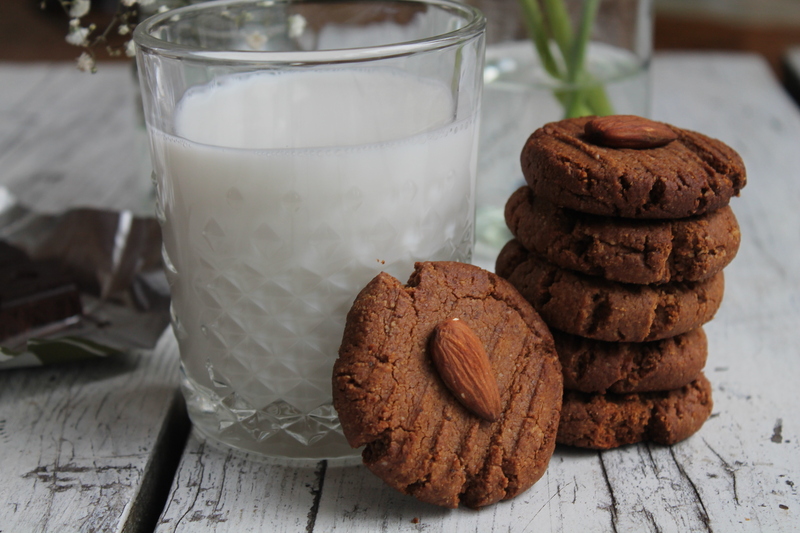 In a large bowl with a fork mix the almond butter with ground almonds and the baking soda. Add all the remaining ingredients and stir throughly. Scoop 1 tablespoon of cookie dough at the time and with a fork mashed delicately down onto the baking tray. Keep doing so until you finish all the dough. Decorate with almonds (optional). Place in the oven and bake for 15-17 minutes until they are slightly golden brown. Remove the tray from the oven and let them to cool for about 10 minutes. They will still be soft as soon as you taken them out but they will harden once cooling down. Store in air tight container or jar for up to a week. Apart from being super simple to make these beauties are also packed with goodness. I know turmeric might sounds a bit unusual but it actually work really well with the zestiness of the lemon and the sweetness of the bananas and it is also a power house of health benefits; it’s one of the food with highest concentration of antioxidants, anti inflammatory properties and it has even been proven to help fighting acne. To top it all off I love having these pancaked with dates syrup caramelised bananas and some more lemon zest grated on top, I promise you the combination is just divine, perfect not only for pancakes day! Place the oats into a blender and blend until a a flour starts to form. Mash the banana in a bowl and then add all the other ingredients to your blender. Blitz well until everything is combined. The consistency should be nice and thick. Heat up a non-stick pan. Use about a ¼ cup of the mix and pour into the pan. Heat until bubbles form about three quarters of the way cooked through and then flip to cook for another minute or two. Repeat with the rest of the mixture. In a frying pan heat up the coconut oil until it’s melted. Slice length way the apple bananas and add them to the pan. Sprinkle the banana with cinnamon and add the date syrup. Cook the banana for about 2-3 minutes until they are golden brown. 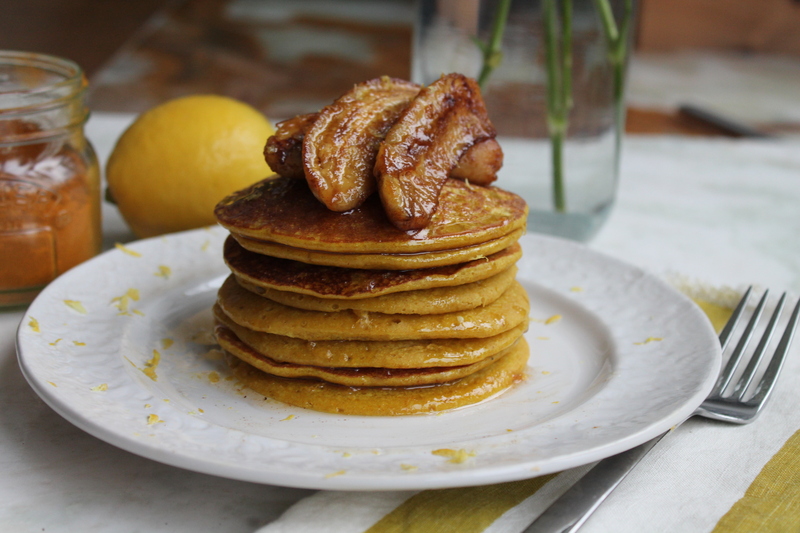 Stack your pancakes and place the caramelised bananas on top and grate some more lemon zest to finish it off!